Is Dark Chocolate Very Fattening? Chocolate was once considered a guilty pleasure, but according to 2009 information from Harvard Medical School, there is now an awareness of the health benefits of dark chocolate -- as long as it is consumed in moderation. If you add an entire dark chocolate bar to your daily calories without eliminating calories elsewhere, it will impact your daily calories and you will gain weight over time. Flavonoids in dark chocolate may have antioxidant and heart-protective benefits. About three squares of dark chocolate, equaling 37 g, make up a single serving, which contains 170 calories, 110 of which come from fat. If you eat a serving a day without any calorie reduction elsewhere, you add 1190 calories to your weekly intake. Since it takes 3,500 calories to gain 1 pound, you would gain 1 lb. every three weeks, or 17 lb. per year. 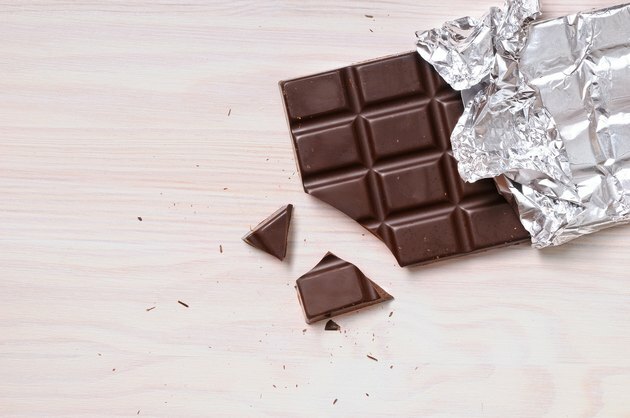 It takes very little dark chocolate to reap health benefits. Eating one small square with around 30 calories, gives you the benefits without the extra calories. Consuming one square per day without reducing other calorie intake would add only 3 lb. per year to your waistline. Dark chocolate that contains more cocoa contains the most flavonoids, the substances that may lower blood pressure and low-density lipoprotein, or LDL, the "bad" cholesterol. Dark chocolate contains between 50 and 80 percent cocoa, so look for the bar with the highest percentage. Almost 65 percent of the calories in dark chocolate come from three different types of fat. Around 33 percent of the fat is in the form of oleic acid, a monounsaturated fat also found in olive oil. Monounsaturated fats have protective benefits on cholesterol levels and the heart. The second fat, stearic acid, is a saturated fat, the type that can raise cholesterol levels, but has a neutral effect on cholesterol because it breaks down into oleic acid. The third fat, palmitic acid is also a saturated fat; however, studies show that eating chocolate does not raise cholesterol levels, Harvard Medical School reports. One large manufacturer of milk and dark chocolates states that both contain the same percentage of fat per serving, 13 g of total fat and 8 g of saturated fat. The difference is in the types of fat. Milk chocolate contains 24 g of sugar compared to 14 g in the dark chocolate. Sugar adds empty nutritional calories that can raise cholesterol levels. A study conducted by the University of Copenhagen and released in December 2008 noted that people who ate dark chocolate 2.5 hours before a meal of pizza ate less than those who consumed milk chocolate. The study indicated that dark chocolate keeps you satiated longer, lessening cravings for sweet, salty and fatty foods. Harvard Health Publications: Chocolate and Your Health: Guilty Pleasure or Terrific Treat?